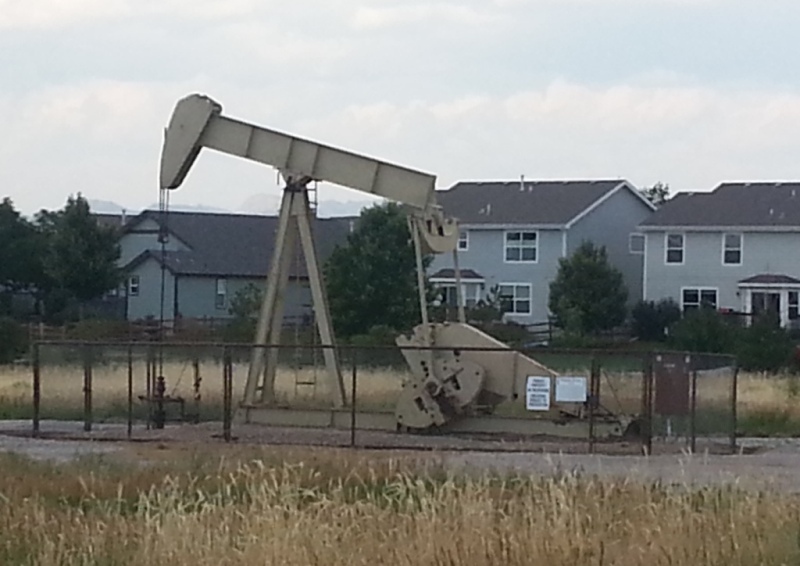 Oil production near homes in Fort Collins (David O. Williams photo). The highly contentious debate over whether Colorado cities and towns can control oil and gas drilling within their boundaries will rage on deep into 2016, regardless of how the Colorado Supreme Court rules on two city fracking-ban cases it heard oral arguments on Wednesday. And a rulemaking process by the state’s chief regulatory agency, the Colorado Oil and Gas Conservation Commission, is only serving to fan the flames of that debate. After a third hearing on Monday, the commission scheduled yet another hearing on local control rules for Jan. 25, despite director Matt Lepore’s goal of finalizing the rules by the end of the year. Several issues – including the role of counties — remain undecided in the rulemaking process that stemmed from recommendations made by Gov. John Hickenlooper’s Oil and Gas Task Force, which was set up by executive order in 2014 as part of a compromise to avoid the expense and rancor of two anti-drilling and two pro-drilling ballot questions that year. Now it appears likely that Colorado voters will be asked to decide the local-control issue in November of 2016, with one constitutional ballot question entitled Right of Local Community Self-Government already submitted to the Colorado Legislative Council and a group called Coloradans Resisting Extreme Energy Development promising several more. Whether CREED and other anti-fracking groups have enough financial backing to gather the necessary 98,492 valid signatures of registered voters by Aug. 8 remains to be seen, but pro-industry proponents promise they’ll counter with well-funded measures of their own. “I would be the first one in line to run a ballot initiative to make sure that we have energy independence in this country and especially in Colorado,” state Sen. Jerry Sonnenberg, R-Sterling, told The Colorado Statesman. Sonnenberg, who was the primary proponent of 2014’s Initiative 121, which would have prevented any local government that banned oil and gas production from receiving state revenues generated by the industry, regrets agreeing to the 2014 compromise and pulling the initiative. “It’s worse than I actually anticipated, because not only are we facing the same [anti-drilling] ballot initiatives, but the task force that was created came up with nothing and that wasn’t good enough, and so now they’re trying to find other ways through rulemaking, not legislation,” Sonnenberg said. State Rep. Joe Salazar, D-Thornton, said there needs to be more local control over the location and intensity of drilling operations to protect the health, safety and welfare of Front Range residents as the industry moves into more densely populated areas. And he thinks the legislature should resolve the issue as the new session kicks off Jan. 13, not statewide voters in November. “It would be really sad if the elected representatives and senators of the state of Colorado couldn’t sit down together and figure this out themselves to where we abdicate our responsibility and have to go to the voters on this,” Salazar told The Statesman. Salazar is holding a town hall meeting from 1 to 2:30 p.m., Saturday, at Delight Me Sweets in Thornton to outline a bill he plans to run this session on earthquakes and hydraulic fracturing and to discuss a controversial drilling proposal in the Wadley Farms neighborhoods of unincorporated Adams County. Salazar wants to hold drilling companies liable if their injection wells used to dispose of fracking fluids and chemicals cause earthquakes that injure people or cause property damage. He points to clusters of earthquakes in heavily drilled parts of Oklahoma that have prompted lawsuits against the industry and sparked an intense debate over whether injection wells are the cause. With Republicans in control of the Senate by a one-seat margin, Salazar isn’t confident legislation aimed at further regulating the state’s oil and gas industry will make it to Hickenlooper’s desk, but he’s hopeful because he says GOP voters are also being impacted. Sonnenberg said it will be tough to pass any oil and gas bills this coming session because the House is controlled by Democrats with a three-seat majority. “With the House of Representatives controlled by the Speaker of the House [Dickey Lee Hullinghorst] being from Boulder and representing that area, I don’t see how any legislation comes through either chamber to make either party happy,” Sonnenberg said, adding that gridlock has fueled the state’s local-control rulemaking process, which he deems unnecessary and redundant. Conservation Colorado Executive Director Pete Maysmith, whose group supported the 2014 compromise that pulled the four ballot questions, recently told The Statesman the task force process and rulemaking “lacked substance” and that “plainly the job was not done,” repeating comments his organization made in February. Maysmith’s organization is not currently backing any specific ballot proposals. The Right of Local Community Self-Government question was proposed by an issues committee called Coloradans for Community Rights. While their question deals with local government control, it’s not aimed solely at curbing oil and gas development, a proponent said. Mazza said the initiative, which would amend the Colorado Constitution, could be used to limit factory farming or to increase the minimum wage in communities. On Wednesday, the Colorado Supreme Court heard arguments in lawsuits filed by the Colorado Oil and Gas Association challenging a Longmont fracking ban and a five-year fracking moratorium in Fort Collins. The court has not yet ruled on the pivotal cases.